Third revised edition, loaded February 3, 2016. Sûta said: "After thus hearing from the great sage among the gods about his birth and exploits, sage Vyâsadeva, the son of Satyavatî, asked him another question. 'Vyâsa said: 'What did you do after the mendicants had departed who instructed you in wisdom before your present life began? Oh son of Brahmâ, what were the conditions you spent your life in after this initiation and how have you, after in the course of time having abandoned your body, achieved this body? S'rî Nârada said: 'The great sages in my previous life gave me the transcendental knowledge I have at present and after they had departed I did the following. I was the only son of my mother who was a simple woman who worked as a maidservant. She had no one else, so that I as her offspring, was completely determined by the emotional bond I had with her. Although she wanted to take care of me properly, she could not do so because she, like everybody, was as dependent as a puppet on a string. I took it as a benediction of the Lord who always wishes the best for His devotees, and with that in mind I headed for the north. There I found many flourishing big and small towns and villages with farms, mineral and agricultural fields in valleys with flower and vegetable gardens and forests. I saw hills and mountains full of gold, silver and copper and elephants pulling branches from the trees nearby delightful lakes and ponds full of the lotus flowers aspired by the denizens of heaven - and my heart was pleased with the birds and the number of bees hovering about. All alone, I passed through impenetrable thickets of bamboo, reed, sharp grass and weeds, and reached deep and dangerous forests that were the playground of snakes, owls and jackals. Physically and mentally exhausted, I, hungry and thirsty, took a bath and drank from the water of a lake from a river so that I found relief from my fatigue. In that uninhabited forest I sought my refuge under a banyan tree and emptied my mind, by focussing upon the Supersoul present within myself, as I had learned from the liberated souls. Thus meditating on the lotus feet of the Supreme Personality, all of my thinking, feeling and willing transformed into transcendental love. In my eagerness tears rolled down my cheeks as I slowly saw the Lord appearing in my heart. Fully overwhelmed by an excess of love and transfixed in feelings of happiness all over my body, I oh sage, being absorbed in an ocean of ecstasy, did not see Him or myself any longer. No longer seeing the form of the Lord who removes all disparity from the mind, I all of a sudden perturbed got up like someone having lost something desirable. Desirous to experience that again, I focussed all of my mind on the heart but saw Him not reappear despite my patient waiting and thus frustrated got very distraught. Trying and trying in that lonely place, I heard from the beyond pleasing words of gravity being spoken to me that mitigated my grief. 'Listen, for as long as you live you will not get to see Me here, because for someone not completely united it is, with all impurities, difficult to acquire My vision. That form was only shown once to awaken your desire, oh virtuous one, for with the devotee's growing desire for Me, all lust will be driven from the heart. By just a few days having been of service to the Absolute you have attained a steady intelligence unto Me. In your [thus] forsaking this imperfect material world you [from now on will] head for - and are part of - My associates. Thus having spoken, that astounding and wonderful sound of the Unseen Lord in the sky stopped. Grateful for His grace, I then bowed my head in obeisance to Him, so great and glorious. Free from perplexity exercising the holy name of the Unlimited One and constantly remembering His mysterious and beneficial activities, I traveled the earth liberated from desire with a happy mind and awaited my time without any pride and envy. Free from being attached thus being absorbed in Krishna [*] oh Vyâsadeva, in due course of time death came for me as natural as lightning being accompanied by a flash. Having been awarded with a transcendental body befitting an associate of the Lord, I upon seeing that my acquired karma had ended, quitted the body that is composed of the five material elements. At the end of the worldly period [kalpa] having laid Himself down in the waters of devastation, the Lord took me, with the creator and all, in with His breath. A thousand ages later, when the creator was expired again, I reappeared together with rishis like Marîci. Faithful to the vow [of yoga] traveling both within the three worlds and in the beyond, I, because of the mercy of Mahâ-Vishnu, am free to roam, wherever and whenever I want. I move around, constantly singing the message of the Lord, while I vibrate this transcendentally charged vînâ the Godhead has given me. Singing thus soon, as if called for, the sight appears within my mind, of the Lord of the lotus feet whose actions one gladly hears about. I arrived at the insight that for those who are full of worries in their continuous desire for the objects of the senses, there is a boat to cross over the ocean of material nescience: the repeated singing of the glories of the Lord. Time and again with the discipline of yoga in self-restraint curbing lust and desire, will certainly not be as satisfying for the soul as the devotional service to the Personality of Godhead. Upon your request, I described to you who are free from sin, everything about the mysteries of my birth and activities, so as to serve the satisfaction of both your soul and mine.' "
Sûta said: "After thus having addressed the powerful sage, Nârada Muni took leave of the son of Satyavatî and, vibrating his enchanting vînâ, left for wherever he wanted. All glory and success to the sage of the gods who takes pleasure in singing the glories of Him with the S'ârnga [His bow] in His hands, and thus, with the help of his instrument, enlivens the distressed universe." 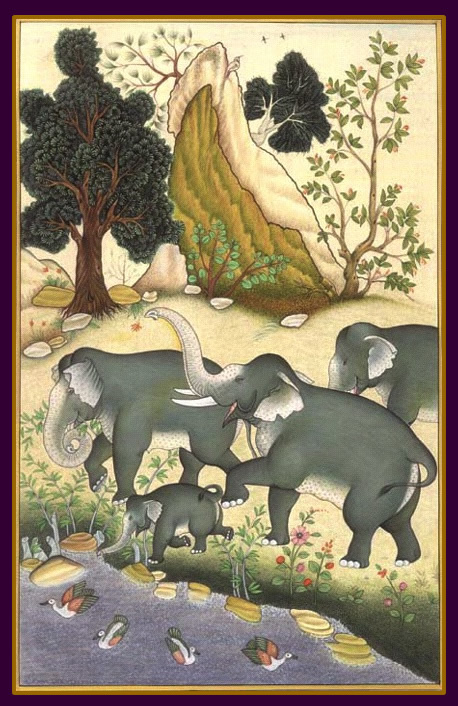 The picture is titled 'Elephant herd" and painted by Kailash Raj. © Exoticindiaart.com used with permission.